We’ve heard that tucked away in the upper reaches of a canyon in the Orocopia Mountains is a tiny stone cabin. It’s supposedly perched high above the canyon bottom to avoid flash floods and exhibits loving attention to detail in the placement of thousands of rocks that form not only the cabin itself but also the supporting terraces and surrounding features. 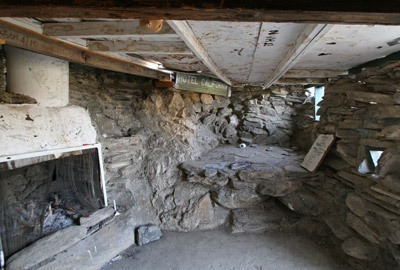 Inside, next to a small fireplace, is a sign that reads Hotel California. Sounds interesting, eh? Let’s go find it and have a look! Oh, since we’re going to be in the Orocopia Mountains for the cabin hunt, we might as well also stop by the old Orocopia Fluorspar Mine, sometimes referred to as the Holmestake Mine. The mine is found along the Red Canyon Road and hasn’t been worked for many years. Rockhounds, though, have dug along the old veins looking for samples of a rather unique brecciated fluorspar that, when polished, produces some very showy specimens. Finding some of that material would be the perfect end to a day of desert exploring! Saddle up! We’re goin’ exploring!